A drawback about this is that it needs to be done in each master page that your site is using and for each sub-site. With Visual Studio, we are able to create different build configurations with the Configuration Manager. This allows us to create different web.config files for a particular build target like Stage, Prod. The idea behind this is that each target configuration contains the correct application settings for that target environment. 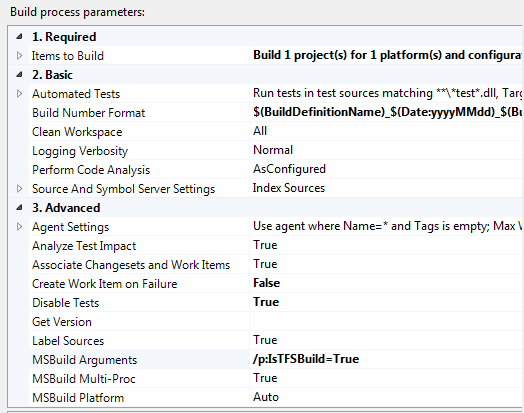 This element allows the MSBuild process to know in what assembly to find the TrasnformXml task. We need to note that the path is the one on the Build Server not a personal work station. The target is the action that runs the transformation process. We want this to be done AfterBuild has completed, and we only want this done when the IsTFSBuild argument is not empty. We add this argument to the TFS build definition. The message element helps us make a log entry, so that we can validate if this action is getting executed. *Note this can also be done as part of the build definition, but web.config is only applicable to web projects. A merged web.config file should be copied to the Bin folder. Make sure to not include two target elements with the same name (AfterBuild). The last element always override the one that was declared before it. Now, we can queue a build and take a look at the _PublishedWebSites folder. The web.config file should be merged with the configuration from the build target. In case this did not happen, we can look at the build log file. We can look for the AfterBuild tag and find the message that was added to the project file. If this is not visible in the log file, we need to make sure that there are no typos on the changes and arguments that we are using. This process is a key component for the delivery a build and deployment automation process. Management of configuration files for multiple environments.